L. Privy Seal appointed Speaker during the L Keepers Absente. p. Epus. Co et Lich. p. Epus. Bath et Well. Epus. Oxon. p. Ds. Coventry, Ds. Custos Magni Sigilli. Ds. Weston, Ds. Thesaur Angliæ. Vicecomes Conway, Præs Concilii Domini Regis. p. Comes Maunchester, Ds. Cust. Privati Sigilli. Comes Lindsey, Magnus Camerar. Angliæ. p. Comes Arundell et Surr. Comes Marescall Angliæ. p. Comes Mountgomery, Cam. Hospitii. p. Vicecomes Say et Seale. Ds. St. John de Bas. MEMORANDUM, That the Lord Keeper came not this Day, for want of his Health, wherefore a Commission, signed by the King, and sealed with the Great Seal, was awarded unto Henry Earl of Manchester, Lord Privy Seal, authorizing him the Room of the Lord Keeper, from Day to Day, and as long as the Lord Keeper shall be absent, &c. dat. decimo quinto Februarii, Anno 4° Coroli Regis. "Charles, by the Grace of God, King of England, Scotland, France, and Ireland, Defender of the Faith, &c. To Our Right Trusty and Right Well-beloved Cousin and Counsellor Henry Earl or Manchster, Lord Keeper of Our Privy Seal, Greeting. "Where Our Right Trusty and Right Well beloved Counsellor Thomas Lord Coventry, Lord Keeper of Our Great Seal of England, is at this Time so visited with Sickness, that he is not able to travel to the Upper House of this Our present Parliament, holden at Westm. 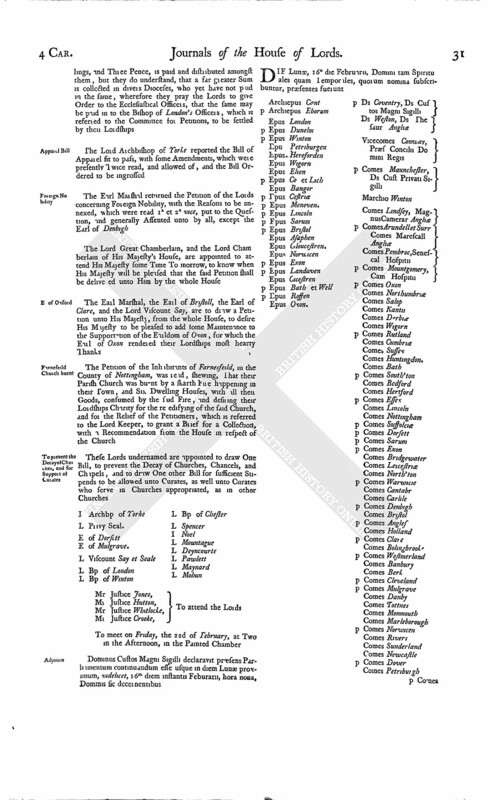 nor there to supply the Room and Place in the said Upper House, amongst the Lords Spiritual and Temporal there assembled, as to the Office the Lord Chancellor of England, or Lord Keeper of the Great Seal of England, hath been accustomed, We, minding the same Place and Room to be suo lied in all Things as appertaineth, for and during every Time of his Absence, have named and appointed to, and by these Presents do constitute, name, appoint, and authorize you, from Day to Day, and Time to Time, when and so often as the said Lord Keeper shall happen, at any Time or Times during this present Parliament, to be absent from his accustomed Place in the said Upper House, to occupy, use, and supply the said Room and Place of the suo Lord Keeper, in the said Upper House, amongst the Lords Spiritual and Temporal there assembled, at every, such Day and Time of his Absence; and then and here, at every such Time, to do and execute all such Things as the said Lord Keeper of the Great Seal of England should or might do, if he were there persorally present, using and supplying the same Room. Wherefore We will and command you, the said Lord Privy Seal, to attend to the Doing and Execution of the Premises with Effect And these Our Letters shall be Your sufficient Warrant and Discharge for the same, in every Behalf. In Witness whereof, We have caused these Our Letters to be made Patents. Witness Ourself, at Westm. the 15th Day of February, in the Fourth Year of Our Reign. This Commission being read, the said Earl of Manchester went to the Wool-sack; and then Prayers were read. 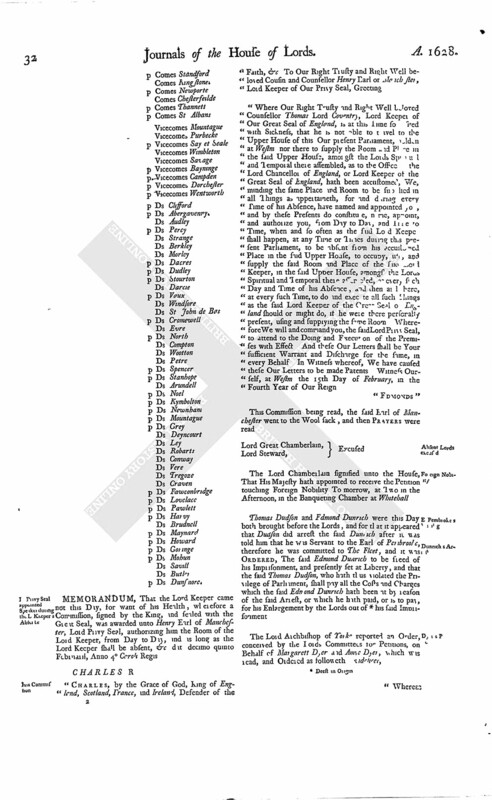 The Lord Chamberlain signified unto the House, That His Majesty hath appointed to receive the Petition touching Foreign Nobility To-morrow, at Two in the Afternoon, in the Banqueting Chamber at Whitehall. Thomas Dudson and Fdmond Dunrich were this Day both brought before the Lords, and for that at it appeared that Dudson did arrest the said Dunrich after it was told him that he was Servant to the Earl of Pembrooke, therefore he was committed to The Fleet; and it was Ordered, The said Edmond Dunrich to be sreed of his Imprisonment, and presently set at Liberty, and that the said Thomas Dudson, who hath thus violated the Privilege of Parliament, shall pay all the Costs and Charges which the said Edmond Dunrich hath been at by reason of the said Arrest, or which he hath paid, or is to pay, for his Enlargement by the Lords out of (fn. 1) his said Imprisonment. 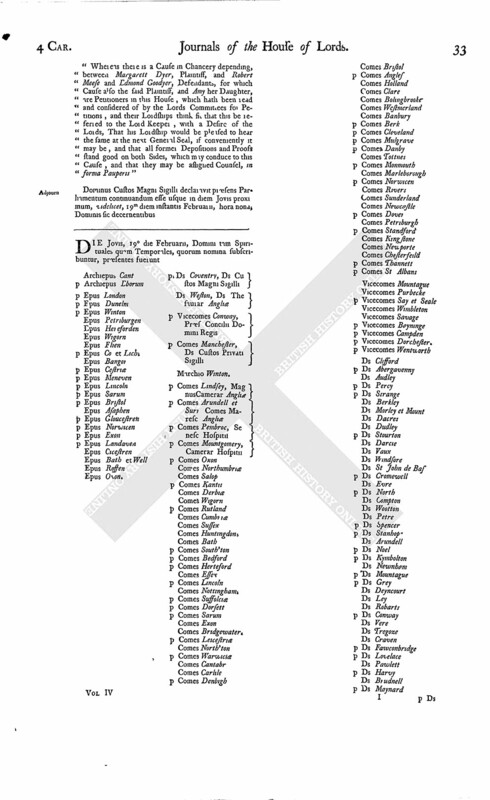 "Whereas there is a Cause in Chancery depending, between Margarett Dyer, Plaintiff, and Robert Meese and Edmond Goodyer, Defendants, for which Cause also the said Plaintiff, and Amy her Daughter, are Petitioners in this House; which hath been read and considered of by the Lords Committees for Petitions; and their Lordships think fit that this be referred to the Lord Keeper; with a Desire of the Lords, That his Lordship would be pleased to hear the same at the next General Seal, if conveniently it may be; and that all former Depositions and Proofs stand good on both Sides, which may conduce to this Cause; and that they may be assigned Counsel, in forma Pauperis". Dominus Custos Magni Sigilli declaravit præsens Parliamentum continuandum esse usque in diem Jovis proxi mum, videlicet, 19m diem instantis Februarii, hora nona, Dominis sic decernentibus.